You might not find gram flour/black salt in your local supermarket - if not, check out an Asian supermarket (Belfast people: I found mine in Lee Foods). Black salt is not essential however it gives the mixture an 'eggy' taste, kinda like an omelette.. I've never liked eggs but love the taste of black salt in savoury pancakes/tofu scramble 💚 try it! Also, there's no particular reason for this combination of toppings - just stuff that needed used up in the fridge. These pancakes are amazing with mushrooms, spinach, guacamole, hummus.. pretty much any savoury topping you can think of! Begin by preheating your oven to 200°c. Chop tofu into smallish chunks and sprinkle over remaining ingredients. Mix together until all pieces are coated, place on a baking sheet and set into oven. DONE. This will need around 20 mins to get nice and crispy. While the tofu is baking, chop up your chosen veggies and begin to cook. I used half a leek and about three handfuls of spinach this time. I sauteed it in a little sesame oil and water. Now put your gram flour and the rest of your pancake ingredients into a blender cup and blend on high for about 20 seconds. The consistency should be what you would aim for with a normal pancake - not too thick/watery. Add in extra water or flour as necessary if you need to adjust. Let the batter sit for a few minutes. Heat some coconut oil/rapeseed oil in a non-stick pan on medium heat. Use a kitchen towel to spread the oil around the pan. Pour in your pancake mixture - it should need around 5 mins on the first side and about 2/3 when you flip it. While the pancake is cooking, mix all tahini sauce ingredients together with a fork - you may need to use a little hot water to loosen the mixture up. Once mixed, set into the fridge for a few minutes to thicken up. 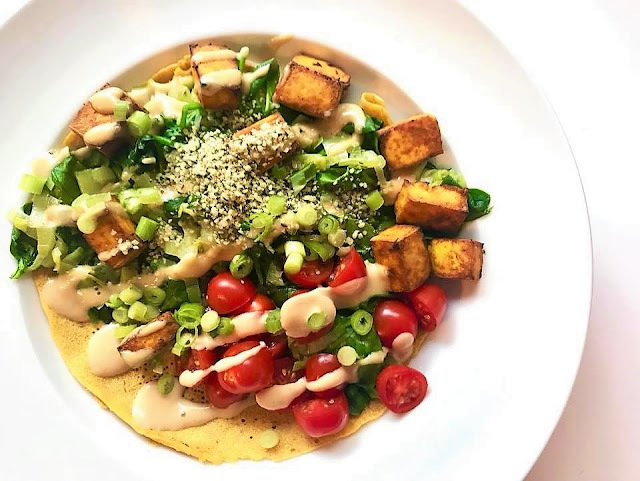 Once your pancake is done, plate up with sauteed veggies, baked tofu and a drizzle of tahini sauce 👌 I sprinkled some hemp seeds on top too.. gotta get dem omegas in! ENJOY.